First things first – this is NOT a glamorous post. Neither the quality of the photos, nor the subject in the photos would count as anything near to pretty. This is one of those reality check kinda posts. So it’s hot. And though Pittsburgh isn’t as bad as DC, it is still unbearable when you factor in the humidity. And we don’t have central air. Nope. Just a unit in the wall beneath our living room window. 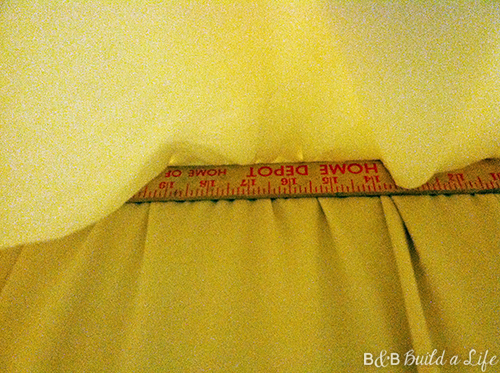 First spotted when we shared with you the addition of our back-tab drapes. See those here. Yup. That sorry feller is pumping refreshing, cool air for our entire (albeit small) apartment. And the bedroom is on the complete opposite of the apartment, past the kitchen, hall closet, hall and bathroom. We’ve been keeping the closets and bathroom doors closed to focus the AC, but the kitchen is this black hole of hot hair. Between the fact that it gets warm if we actually cook anything, but also appliances like our refrigerator naturally produce some heat too making it an uncomfortable situation. That’s the view from inside the kitchen showing off our spectacular drapes. They’re actually an old flat sheet from a queen sized bed that have been folded in half length wise so they provide full coverage of the doorway while also having some room to gather a bit. But how did we hang it? Let’s take a closer look. See how the top has a sort of ruffle look too it? 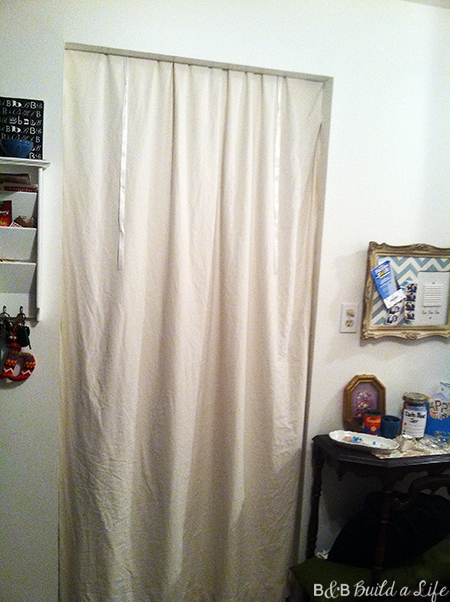 To make it fit the doorway, we folded the sheet down so that it was about 6 inches taller than the doorway. 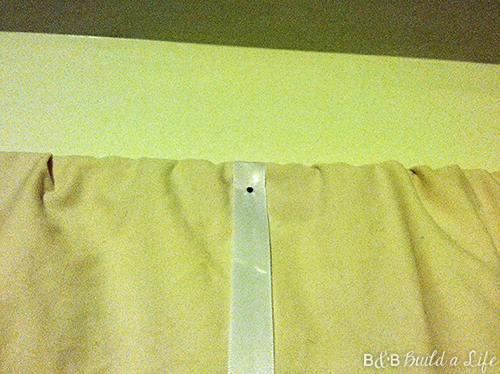 To secure it to the wall in a way that wouldn’t let heat flow around it (which normal curtain hardware would) we actually nailed it to the wall with a few small brads. See that? That’s just an old freebie HD yardstick we used to give the drape some structure and of course to nail it through to the wall with. and while we did this, I was also sure to evenly distribute the fabric, allowing there to be some gathering and overlapping so it would be a little full. 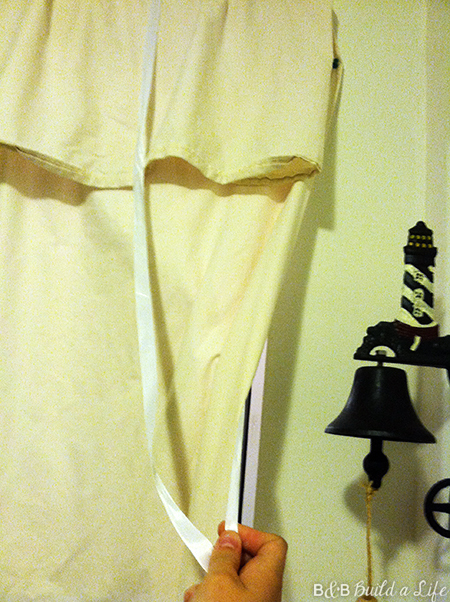 To be able to use it when we need, but get rid of it when we don’t, I devised a way to tie the curtain out of the way. I picked up some simple white ribbon and cut 2 strips about a yard and a half in length. When nailing through the drape and yardstick to the wall, we made sure to evenly space the ribbon on either side and nail through them as well. The ribbon was folded over the outside, over the top of the drape so it hung down both sides. That way when we weren’t using the drape, we could roll it up and tie it out of the way. (Think like the window flaps on a tent.) I would roll it up and tie some pretty bows for you to see, but that would let the heat out of the kitchen. No bueno! Here’s the view from outside the kitchen. (yup, there’s the date night jar on our freebie table. And the artwork I STILL haven’t hung, and our creative optical illusion memo board too…) The lighting is still not ideal here at night, but at least from this side you can get a better idea on the colors. The sheet/drape is white and so is the ribbon, so they generally appear pretty seamless in real life. And the second you pass into the kitchen it’s instantly 5-10 degrees warmer in there, so it’s doing a good job. So, not everything around here is pinterest worthy, but sometimes you gotta get crafty to save your sanity. And maybe a little on the energy bill too?